The Senator met doctors and patients in Toronto. U.S. Sen. Bernie Sanders meets Ontario Premier Kathleen Wynne on a visit to the Women's College Hospital in Toronto on Saturday. One of America's strongest advocates for universal health care was in Toronto on Sunday to see how Canada does it. U.S. Sen. Bernie Sanders, who is trying to gain support for a single-payer health care bill in the United States, met with patients, doctors, and politicians to learn about Canadian health care. 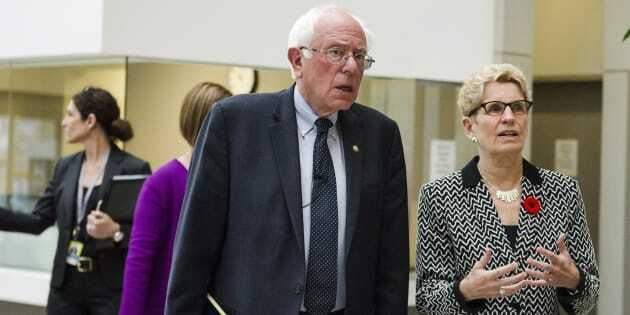 "It's an honour and a compliment that Senator Bernie Sanders chose to come to Ontario to learn more about single payer, universal health care," Ontario Premier Kathleen Wynne said in a press release. She "showed off" Canada's health care system by taking Sanders on tours of multiple hospitals. One patient told Sanders that Canadians do pay for their health care — in their taxes — but that it's worth it, Wynne said in a tweet. Sanders has been fighting an uphill battle for single-payer universal health care since the early 1990s. He's often used Canadians to make points about the American health care system. Toronto doctor Danielle Martin even appeared beside Sanders when he announced his single-payer bill in September. At the rally, Martin flashed her Ontario health card. She told the crowd that after giving birth, all she had to do was hand it over, "and that was it." "I wish that all of my American neighbours could experience the same simplicity in their moments of need," she said. U.S. Sen. Bernie Sanders and Ontario Premier Kathleen Wynne smile during a visit to Mount Sinai Hospital as part of a cross-border tour of the Canadian health care system, in Toronto on Saturday. Martin says that health care is intrinsic to Canada's identity. On Sunday, Sanders noted that health care reflects something deeper about a country. "How a country deals with health care for its citizens isn't just about about medicine or technology," Sanders said on Twitter. "It's about its core values as a nation."